The Republican Party has once again proven itself to be an enemy of science and higher education — this time in the form of its new tax plan, the Tax Cuts and Jobs Act. With a vote of 51-49 during the early hours of Dec. 1, the Senate passed the GOP’s latest plan — a draft riddled with last-minute revisions scribbled in its margins — just hours before the vote. Beside tax cuts for corporations and the wealthy that could amount to $1.5 trillion over the course of the next decade, many students are upset with the plan for more personal reasons. In its current form, the plan may make it impossible for some to attend graduate school or pursue Ph.D. programs. Many graduate students obtain tuition waivers from their universities — exemptions from certain portions of tuition — as a way to pay for their education without taking out more loans than they can handle. The waivers often come with a stipulation that recipients must work full time in research or teaching positions. This earns them an average reduction of more than $12,500 per year that goes directly into paying for tuition. The Tax Cuts and Jobs Act also repeals a section of the current tax code exempting tuition reductions from being considered taxable income. If the bill becomes law, tuition waivers will be considered taxable income, according to the seven brackets proposed by the new plan. But this is a tax on money students never get to see. The tuition waiver reduces the total cost of tuition for the student, but doesn’t put a check in their hands. It would be like applying a sales tax to the amount of an item that was removed through a coupon. The money never actually belongs to the student, just as the money from a coupon never belongs to the consumer — and many think it’s wrong to apply taxes to money that seemingly doesn’t exist. The average salary of U.S. grad students falls at just over $30,000 per year, meaning students who accept the average $12,500 waiver would be taxed for an income that represents roughly 140 percent of their actual income. For students who already face tens of thousands of dollars of debt — and particularly for low-income students — the extra tax burden may make the difference between pursuing a higher education and not. Academia already has a huge privilege problem — according to a 2016 report by the Pell Institute for the Study of Opportunity in Higher Education, college graduates whose families earned more than $116,000 annually accounted for more than 50 percent of degrees awarded in 2014. 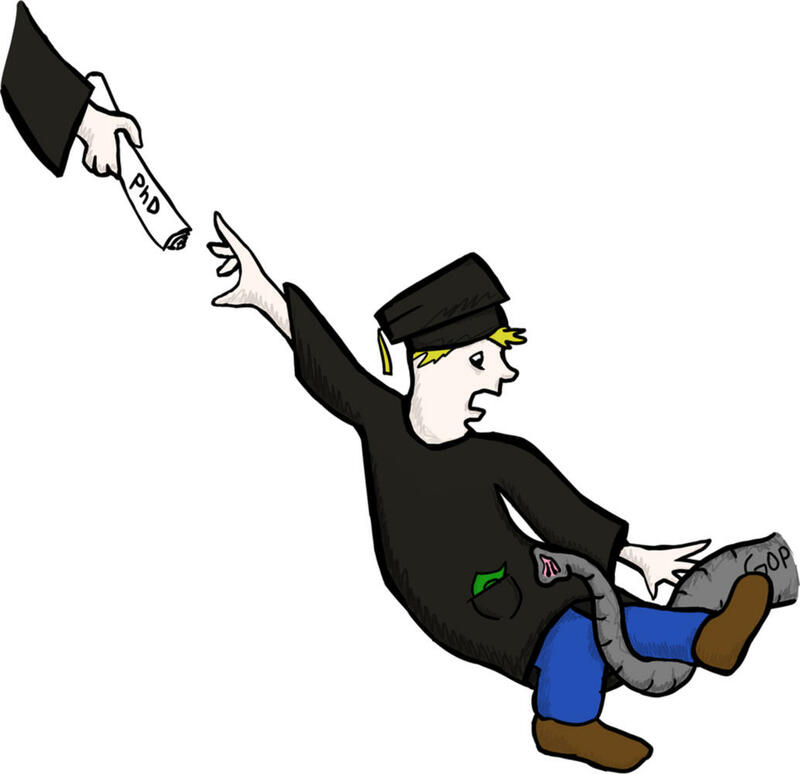 Graduates from families that earned less than $35,000 accounted for only 10 percent of degrees awarded. That is, more than half of all graduate degrees were awarded to students who came from families making twice as much as the median household income of about $54,000, while only a fraction of degrees were awarded to students from families hovering near the federal poverty line of $24,600 per year for a family of four. The GOP’s tax plan does an excellent job of exacerbating this inequality. Only those who can afford to take out more loans to pay off the tuition no longer covered by a waiver, or pay off the taxes on tuition waivers, will be able to continue with grad school or Ph.D. programs — pushing lower-income and middle-class families even further out of the realm of higher education. On a larger scale, universities will lose powerful perspectives that could guide research and instruction in ways that an exclusively wealthy student body would never be able to do. We need economic diversity in our schools to promote diversity of thought, discussion and problem-solving that will translate to real-world change. Without it, American intellectual life will stagnate. He cited the 57 percent of tuition waivers given to STEM students, according to figures from the Department of Education — meaning STEM, the most rapidly emerging field of education, will suffer the most when it comes to economic diversity. If we want to create a word that’s accessible to all regardless of income, we must make sure the people designing it come from diverse backgrounds. Students who receive tuition reductions are working in labs to cure cancer and other degenerative diseases, they’re helping educate their peers and they’re working toward raising America’s academic standing in the world. The GOP plans to cut funding for science at a time when STEM research and education should be at the forefront of our nation’s priorities. Decreased graduate enrollment would also harm the U.S. economy. According to a 2017 report by the Biotechnology Innovation Organization, academic patent licensing created more than $28.7 billion in net sales and generated more than four million person years of employment from 1996 to 2015. The patents are for medicine and technology that come from research done by university faculty and students. Without grad students or the financial backing to faculty that comes in the form of waivers, universities would lose the man power necessary to produce capital of that size. The new tax plan is an attack on a group of individuals who are responsible for so much of the scientific knowledge and innovation in the United States. To discourage students from the path of higher education not only hurts them — it hurts the country. But to the GOP, grad students are just another casualty in their war on higher education.